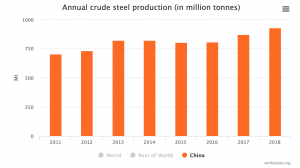 Can the Chinese Government Keep Steel Production in Check in 2019? The Chinese government frequently mandates steel production cuts, especially for environmental reasons. But the cuts have also aimed to cut production volume in support of maintaining higher steel prices and, therefore, a healthier domestic industry. A recent goal of cutting 150 million metric tons of steel production capacity by 2020 was achieved by the end of 2018, according to the Chinese government. (By the way, no such purely production-focused reduction goal exists for 2019). According to a recent Reuters article, on the other hand, in June 2018, China’s State Council banned new capacity development for steel, among so2me other primary commodity products, in some key geographic areas, such as Beijing-Tianjin-Hebei and the Yantze River Delta Regions. 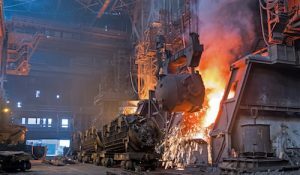 The Chinese government mandated that blast furnace steel operations in Tangshan and Handan, China’s largest steelmaking cities, continue production cuts, but at a reduced rate of 20% of total capacity for April-June (compared to the 30% capacity reduction ordered for the November-March period). These cuts target improvement in air quality by reducing the concentration of PM2.5 particulate matter by a minimum of 5% this year, when compared to 2018. Some production facilities must even leave the region as the government seeks to improve the quality of life in pollution-affected areas, such as Beijing, which is surrounded by Hebei province (the location of multiple steelmaking cities, including Tangshan and Handan). When prices rise, however, these mandates become more difficult to enforce. According to Reuters, spot 62% grade iron ore for delivery to China recently rose 1.6% to $93 per metric ton and the most-traded May 2019 iron ore contract on the Dalian Commodity Exchange soared as much as 4.1% to 710.5 yuan ($106) per ton — the highest for the Asian benchmark since 2013. Such robust price performance was not a one-day spike, but was reflected across the week as the contract gained nearly 10% during the first week of April on a combination of strong steel mill buying and concerns over constrained supply from both Australia and Brazil. Nor was the bullish sentiment confined to iron ore, as Reuters reported coking coal on Monday rose 1% to 1,258.5 yuan ($187.29) a ton, and coke rose 1.4% to 2,048.5 yuan ($304.86). Demand is at its seasonal peak as the weather warms in China and construction work begins in earnest, pushing up steel futures by more than 3% in early April. According to Reuters, the most-active construction steel rebar contract on the Shanghai Futures Exchange recently rose as much as 3.6% to 3,710 yuan ($552) a ton, its highest since Aug. 22, while hot-rolled coil jumped as much as 3.4% to 3,955 yuan a ton ($588). Such performance suggests the steel market is roaring in China, fueled by another infrastructure spending spree, but the reality is something different. 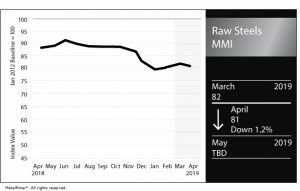 The Raw Steels Monthly Metals Index (MMI) fell by one point this month to 81, a 1.2% decline from the previous month’s MMI value. Price weakness in the index came from the U.S. HRC 3-month futures contract, with a 6.3% decline in price this month, while Chinese Dalian coking coal prices declined by 7.2%. The declining prices pulled the index down, in spite of the 16.2% increase in Korean scrap steel prices. U.S.steel prices generally trended gently upward after stabilizing earlier in the year. CRC prices increased by around 3% on a month-on-month basis, while HDG increased by nearly 3%. HRC prices edged up by just over 1% while plate prices held steady month on month. Overall, prices stayed firm, in line with seasonal supply and demand factors at work in construction, in particular. Generally stronger-than-expected industrial performance in both the U.S. and China provided price strength. 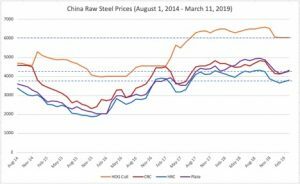 Similarly, and in line with more positive economic data than generally anticipated, Chinese steel prices increased so far this year, leading the U.S. price increase (as generally expected by technical analysis of steel prices since Chinese prices tend to move first). 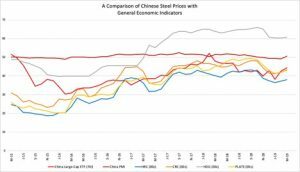 Based on a basic visual comparison of Chinese steel prices with the China Manufacturing Purchasing Managers Index (PMI) trendline, as the PMI crosses the threshold over 50, steel prices tend to increase while they tended to fall during months of contractionary sub-50 readings. As we can see the PMI trending upward, we can expect steel prices to rise. On the other hand, the comparison of trendlines between steel prices and China’s FXI, a large-cap ETF index, shows a relationship that appears weaker, with values moving in opposite directions at times (although still typically following a similar movement). Given that China’s PMI reading increased recently, this indicates the potential for steel prices to show strength. 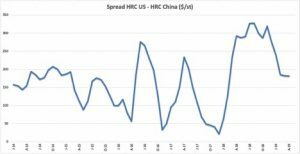 The spread between U.S. HRC and China HRC prices flattened out for the last couple readings after falling for a few months now, with a price differential in early April of $181/st. 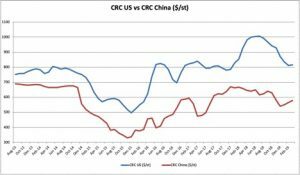 This month, U.S. CRC prices outpaced China CRC prices. The spread once again trended slightly upward between the two after trending more or less downward since July 2018, with the current price differential of around $255/st. Iron ore prices increased again this month, after some moderation in price increases from earlier this year. Weather issues stemming from Tropical Cyclone Veronica in Australia last month kept prices higher, in addition to a general improvement in the industrial outlook in China, which could support higher iron ore prices, and therefore higher steel prices. Coking coal prices, on the other hand, have generally fallen so far in 2019, which may exert downward pressure on steel prices. 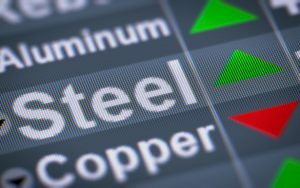 Even with the lower index value this month, some forms of steel still showed upward momentum, indicating prices could be on the rise once again; that is, at least for the short term, supported by stronger-than-expected economic performance in the U.S. and China. Like last month, plate prices continue to sit at high levels. Plate prices sit near $1,000/st, rising again after briefly falling back to $993/st in late March. 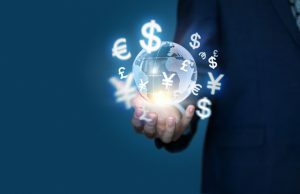 With prices still somewhat higher and other factors indicating some potential to increase further, buying organizations need to watch the market carefully for the right time to buy. For more specific pricing guidance, try our Monthly Metal Miner Outlook Report on us – free for the first two months. U.S. shredded scrap prices stayed flat during March while the U.S. HRC futures contract 3-month price fell 6.3%. Chinese Dalian coking coal prices were down 7.2%, falling the most of all the metals tracked in the Raw Steels MMI basket. The price of Korean scrap steel increased the most, jumping 16.25%. Other price movements in the basket were much more modest, oscillating around the plus or minus 1% mark. This morning in metals news, Nucor announced a major investment toward a new steel plate mill in Brandenburg, Kentucky, steel CEOs ask the Trump administration to maintain the Section 232 duty on steel, and copper prices moved up as U.S.-China trade talks resumed today. Nucor Corporation is making a $1.35 billion investment toward a new steel plate mill in Brandenburg, Kentucky, the steelmaker announced Wednesday. According to a company release, the mill is expected to have an annual capacity of 1.2 million tons and will be fully operational in 2022. With news this week that the Senate is planning on putting forth a bill that will target the president’s Section 232 authority, executives of domestic steel companies are asking the Trump administration to hold firm on maintaining the existing duties on steel imports. The price of copper made gains Thursday as the U.S. and China reconvened for trade talks in Beijing today, Reuters reported. In addition, protests at a Peru copper mine fueled concerns about supply disruption, according to the report. LME copper rose 0.6% to $6,372 per ton, according to the report. The U.S. imported a total of 3.48 million tons of finished steel in January, the American Iron and Steel Institute (AISI) reported this week (based on U.S. Census Bureau data). The January import total marked a 20.7% increase from the January 2018 total. Imports were also up 83.3% compared with December 2018. Finished steel import market share was an estimated 25% in January, according to the report. The 25% steel import market share for January marked a steep increase from December, when it stood at 19% (after four consecutive months at 21%). In 2018, import market share peaked at 29% in April. By country, South Korea was the biggest offshore exporter of steel to the U.S. in January, sending 361,000 net tons (up 298% from the December total). Vietnam (104,000 NT, up 3%). In other steel news, the U.S.’s Section 232 tariffs on steel and aluminum remain in place vis-a-vis NAFTA partners Canada and Mexico. The tariffs are a sticking point for the Canadian and Mexican governments as the three countries work to push the new iteration of NAFTA, the United States-Mexico-Canada Agreement (USMCA), across the finish line. Some U.S. lawmakers have also called for removal of the tariffs before final approval of the deal. The executives of the three countries signed the deal late last year during the G20 Summit in Buenos Aires. However, each country’s legislature must ratify the USMCA before it can go into effect. The Trump administration scored a trade win in a ruling by the U.S. Court of International Trade (CIT) on Monday, as the three-judge panel rejected a challenge to the constitutionality of the Section 232 statute that yielded duties on imported steel and aluminum last year. The Trump administration’s imposition of tariffs on steel and aluminum imports last year rocked the metals world. The tariffs came about pursuant to Section 232 of the Trade Expansion Act of 1962, which affords the president the authority to adjust import levels of certain products if they are deemed injurious to the U.S.’s national security. Ultimately, the Trump administration imposed duties of 25% and 10% on steel and aluminum imports, respectively. In addition, the Trump administration last year launched a Section 232 probe vis-a-vis imports of automobiles and automotive parts, a case which is still pending (last month, Secretary of Commerce Wilbur Ross submitted a report to the president related to the probe, as mandated by the statute). Members of Congress in recent months have put forth bills calling for the limitation of the president’s authority over Section 232. Well before that, however, in June 2018 the American Institute for International Steel (AIIS) — and two of its member companies, Sim-Tex, LP, of Waller, Texas, and Kurt Orban Partners, of Burlingame, California — filed a lawsuit challenging the constitutionality of the president’s Section 232 authority. In addition, the “intelligible principle” concept established, in these cases, the president as “the mere agent of the law-making department.” In other words, the president is, in theory, the conduit for the will of Congress. The opinion continued, noting that “no act has been struck down as lacking an intelligible principle” since 1935 (prior to that year, two statutes had been revoked on grounds they lacked such a principle). The plaintiffs pointed to the 1976 case Fed. Energy Admin. v. Algonquin SNG, Inc. — related to imports of foreign petroleum — in which Section 232 was also the point of contention, arguing “the legal landscape of judicial review of presidential decisions involving implementation of federal statutes has changed markedly” since that ruling. In an opinion by Judges Claire R. Kelly and Jennifer Choe Graves, the judges acknowledged the gray areas living within the statute but ultimately leaned on the precedent of Algonquin. Judge Gary S. Katzmann also agreed to reject the plaintiffs’ case, but in a separate opinion expressed reservations and left the door open for future consideration of the issue. “In the end, I conclude that, as my colleagues hold, we are bound by Algonquin, and thus I am constrained to join the judgment entered today denying the Plaintiffs’ motion and granting the Defendants’ motion,” Katzmann wrote. “I respectfully suggest, however, that the fullness of time can inform understanding that may not have been available more than forty years ago. We deal now with real recent actions, not hypothetical ones. Certainly, those actions might provide an empirical basis to revisit assumptions. The American Iron and Steel Institute (AISI) released a statement Monday applauding the ruling by the CIT. “Today the CIT rightly affirmed our strong belief that the constitutional challenge to the Section 232 statute was and is without merit,” said Thomas J. Gibson, president and CEO of AISI, in a prepared statement. “This lawsuit was theatre by the importers, designed to divert from the real issue which is that unfairly traded foreign imports had a disastrous impact on the steel industry, creating a real threat to our national and economic security. The president’s bold trade actions have now helped the industry gain some momentum, and today’s CIT decision builds on that momentum. This morning in metals news, President Donald Trump indicated Wednesday the U.S. tariffs on China might not be going away anytime soon, copper prices soared to an eight-month high and an Ohio steel company received a state grant to upgrade a railroad spur. As U.S.-China trade talks continue, President Donald Trump on Wednesday indicated the tariffs imposed on China over the last year likely aren’t going anywhere. 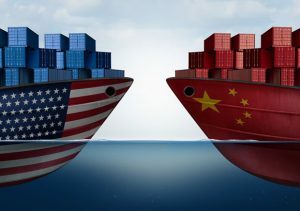 In addition to the Section 232 tariffs on steel and aluminum, the U.S. used Section 301 of the Trade Act of 1974 to impose a total of $250 billion worth of tariffs on imports from China last year. The price of copper got a boost on the heels of Federal Reserve comments indicating the economy has slowed since the fourth quarter of last year. According to Reuters, copper reached an eight-month high, moving against the falling dollar on the heels of the Fed’s comments on the economy; the U.S. dollar index dipped Wednesday afternoon, but has returned to pre-dip levels Thursday. An Ohio steel company, Taylor Coil Processing, has received a state grant of $56,125 to upgrade a rail spur, the Tribune Chronicle reported. The upgrade would facilitate movement of products into and out of Taylor’s plant, according to the report. Citing data from the Youngstown Warren Regional Chamber, more than 350 million pounds of steel were transported into and out of the Taylor plant in 2018, with 10-15% of that total moving by rail. Looking at longer-term trends in Chinese steel prices, we can see after hitting a low during mid-to-late 2015, prices trended upward overall (with some ups and downs along the way). For example, prices dipped in summer 2016, in spring 2017 and somewhat less so in spring 2018. HRC and CRC prices trended very similarly, with the price gap narrowing over time. In fact, Chinese CRC prices stood higher in August 2014 than today’s prices. 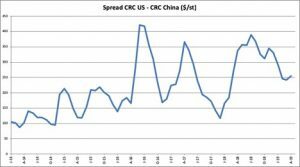 However, prices for CRC have remained above 4,000 RMB since August 2017. HRC prices increased slightly, while plate prices started out lower but trended higher than CRC. Over time, the price differential for HDG increased; however, the price trends reliably with HRC and CRC, especially since August 2017. 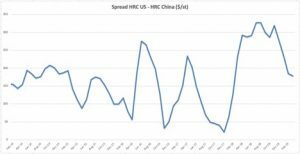 Chinese HRC prices turned around in February and have gained momentum in March. Prices moved similarly for both U.S. and Chinese HRC late in February and into March. 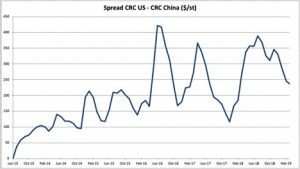 China CRC prices have also increased in the early months of 2019. The price gap between Chinese and U.S. prices narrowed, but still remains wider than prior to imposition of the U.S.’s Section 232 tariffs of March 2018. What can we expect from the Chinese government in terms of production reductions? Why do high-level goals, such as reduced production, fail? “The profit gained from selling one ton of steel is less than the profit from selling one dish of fried pork,” Shen Wenrong, chairman of the largest private steel company in China, was quoted as saying in a 2015 Bloomberg article. This points to a lack of actual willingness of Chinese domestic producers to throttle production. China’s stated policy of production reduction has not happened on a net basis, even after environmental protocols paused production at times. At any rate, production and export figures continue to rise out of China, even as the domestic economy apparently weakens. 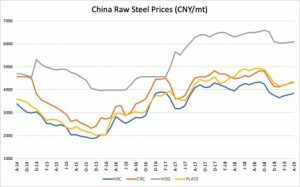 Given that global production capacity for steels continues to increase, we can expect this to have a depressing effect on steel prices overall. On the other hand, if Chinese production moves upstream, it is realistic to expect price increases that stick as production becomes more advanced. Even with China’s continued increase in production, U.S. imports of steel from all global markets decreased by 11.5% in 2018 over the year prior, according to the American Iron and Steel Institute. Revenue also improved overall for U.S. steelmakers, according to government data. However, what happens in China price-wise, will not stay in China. Pricing impacts in China continue to affect global prices given the country’s consistent global share of production numbers at around the 50% over the past few years. 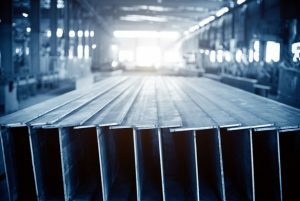 U.S. steel mills produced 1.93 million net tons of raw steel during the week ending March 16, according to the American Iron and Steel Institute (AISI). Production for the week — which came at a capacity utilization rate of 82.9% — was up 5.7% compared with the same week the previous year but down 0.6% from the previous week. Adjusted year-to-date production through March 16 reached 20.3 million net tons — up 6.7% compared with the same period in 2018 — at a capacity rate of 81.4%. For the same period in 2018, mills produced 19.0 million tons at a capacity utilization rate of 76.6%. The U.S. steel sector’s capacity rate continues to climb on the heels of the Trump administration’s Section 232 action last year. In general, a capacity rate of 80% is considered a mark of a healthy industry. U.S. steelmakers increased production in 2018, as they were able to compete against reduced import levels (steel imports into the U.S. were down 12% year over year in 2018). According to the World Steel Association, the U.S. produced 86.7 million tons of crude steel in 2018, up from 81.6 million tons in 2017.